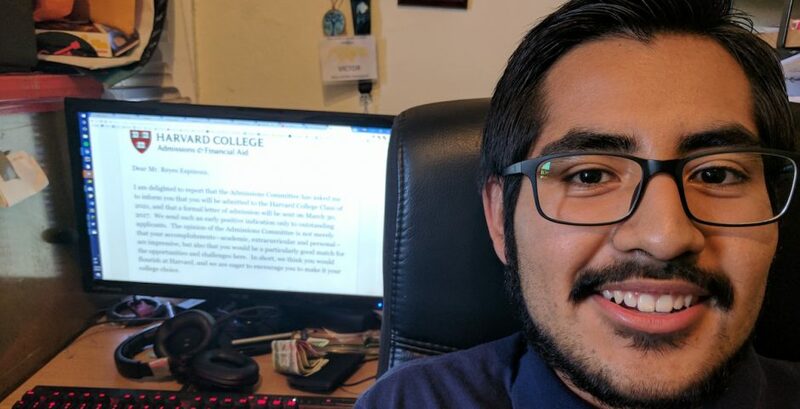 This week, Victor Reyes found out he had been accepted to Harvard, the school of his dreams. The California-based high schooler arrived in the US aged four, crossing the Mexican border to live with his mother and father in Los Angeles. He also shared his application essay with us, printed below, which details how he came to the States, avoided raids from immigration officials and started on his path to college. How did it feel to get into Harvard? It was the best moment of my life, honestly. All my effort has culminated in this. I’ve got something to prove for fourteen years of hard work and studying. My mom brought me to the US when I was four years old to get a good education. Paying her back for the sacrifices she made was amazing. It gave me a sense of fulfilment. Mom, your sacrifice wasn’t in vain! She’s proud. It was such a relief. It was a lot of excitement and happiness. A bit of nervousness too, but like anticipatory nervousness where you’re happy. How did you hear that you were accepted? Oh my god. We had just come from running an errand after school with my parents. I came home, got on my computer and saw an email from admissions. I clicked on it, and saw it was from Harvard – it said: “There has been a status update to your admission.” I was thinking what does this mean? I was freaking out – is it a decision, a rejection, or do they just want information for my financial aid? I was there waiting for 15 minutes for my mom to get back to open it. My mom gets home and says: “Oh my god check it now!” She walks up to the computer and I cover my mouth. As I click it, she covers my eyes so she’s the first to know. She doesn’t understand English, but she saw “Congratulations!” We started yelling and freaking out. It’s exciting and pretty unexpected. Nobody expects or knows they’re getting into Harvard. I didn’t think I had perfect SAT scores, how did they even consider me? To receive such an enthusiastic response from Harvard, it’s so encouraging. What did you write your common app about? 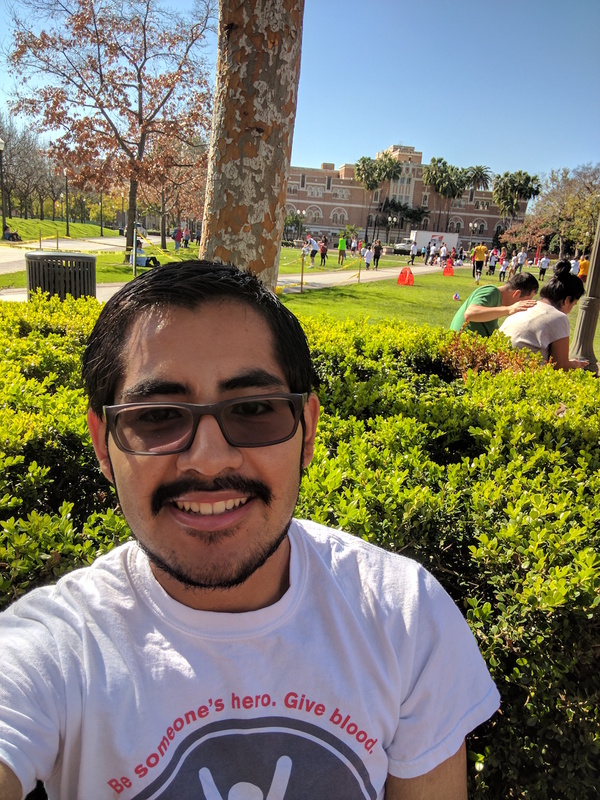 For the personal statement, I focused on my story as an undocumented student. I had this recurring motif, the sentence “Stay very quiet.” That’s what my mom would always say to me. As we entered, we had to go separately. We were separated for about two months. I arrived to Los Angeles to live with my father – I had never met him before. My mom’s decision was to give me a better education – I turned four and that’s when classes start in the United States. Then I talked about how it is to live in fear. My mom always kept the television on Univision, as they announced raids going in the area. She kept it on to stay informed. When I was six, there was a raid that happened right close to where I live – agents were in the building next door. She hugged me and told me everything was going to be OK. She tried to make it a game, saying those are bad people and try to avoid them. She tried to console me and say as long as I’m with her, I’ll be OK.
Then my personal statement references how I couldn’t travel because I was undocumented. Freshman year I was nominated for a trip to go to Boston to visit schools there. My teacher really wanted me to go but I had to reject it because I couldn’t travel without a California ID. DACA hadn’t been passed yet. Later, after DACA passed, I was able to take that opportunity in my sophomore year. How do you feel about Donald Trump’s campaign pledge to end DACA? It’s been pretty grim. You’ve got to be realistic. But you’ve got to pick your battles. I saw a student who spoke out about being undocumented, her DACA permit had expired a couple weeks ago. Before Trump, she might not have gotten arrested. You’ve got to tread lightly and carefully. There’s so many things that are happening that shouldn’t be. ICE are using scare tactics – they’re playing pretty loose. Trump has had many opportunities to revoke it. Nobody knows what kind of person he is at this point. DACA was a very specific promise he made to his supporters. He vowed to end it day one, but after speaking to Obama, he’s mellowed his tone. You just don’t know with him. Are you scared about the next four years? Yes, it’s scary. Under DACA, the whole process submits you to a background check. They say: “We promise we will not use this information to deport you,” but that’s not a legal promise. The possible misuse of that information is scary. But hopefully it never comes to that. This current limbo state is honestly the best thing that can happen right now. So unless something major occurs in the midterm elections, I hope for the best. But even if the worst happens, try to find ways to overcome it. Especially if I go to an institution like Harvard, hopefully they have the resources to help me to succeed somehow. We were destined to Los Angeles, from Mexico, but in order to ensure our safe passing, I had to go first. Alone. Completely confused as to what was happening, all I remember was my mother’s final, long hug. As we left Mexico, something happened that I wouldn’t understand until I was much older. I became an illegal immigrant. In our apartment, the TV was almost always on. Perpetually silent, it served as an early warning alarm for our family. One day, the alarm went off. An emergency announcement stopped the regular programming. Raids, within our area. Terrified, she grabbed me and hugged me. Shortly after, she closed all windows and made sure to deadbolt the door. She saw I was confused and scared so she provided a quick explanation: we are not wanted, they don’t like us, we need to hide. The people who were supposed to protect us were trying to tear us apart. I could not comprehend what we had done wrong. My mother tried to explain our situation to me. We crossed the border illegally. Now, we had no rights and we are not allowed to speak up. Silence does not attract attention and my family’s security depends on not being detected. As I grew up, I witnessed cases where honest, hardworking people were taken advantage of because of their immigration status. I heard a report of someone who worked with an abusive boss who would threaten them with deportation if they made a mistake. I slowly grew more and more conscientious over the injustices illegal immigrants have to face. Still, however, I lacked a voice; I lacked the freedom to express myself. I found my voice in June 2012. My mother and I were ecstatic when we heard of Deferred Action for Childhood Arrivals (DACA) and the opportunities it would give me. Then, I knew nothing stood in the way of my education. I received a Social Security number and a California ID. I was no longer a ghost in the system. I was a person, I lived, I breathed, I moved, I spoke. With DACA, I promised myself I would speak up for those who can’t. I was given an opportunity to be a legal resident of the United States. Countless times I saw students end their education because they were not legal residents. 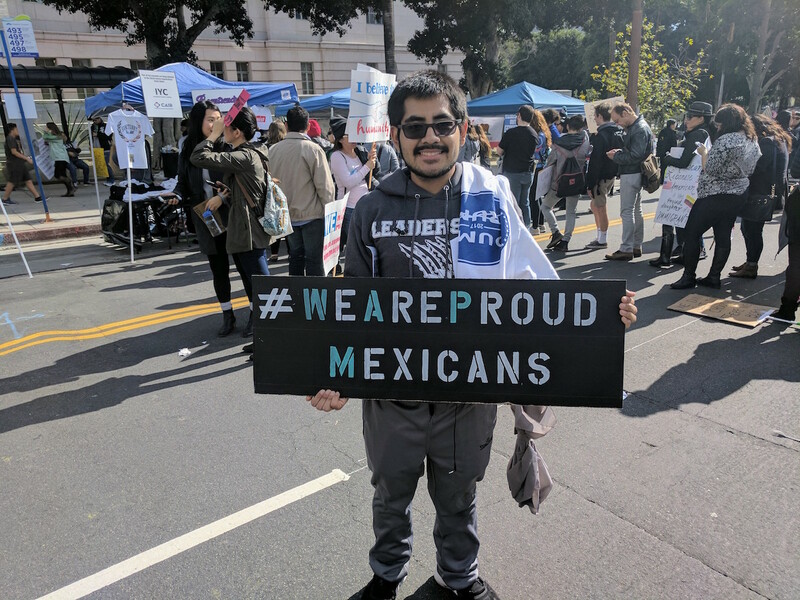 I was grateful for receiving DACA and wanted to make the most out of it. “Stay very still”, my mother said as she buttoned up my jacket. I had been nominated for a field trip to visit universities on the East Coast. This was the first time I was leaving the city of Los Angeles. Previously, I had to reject similar opportunities, but DACA released me;I was free to go where I wanted. As if defying every state border, the airplane took me on a voyage of liberation through the US. From Los Angeles to Boston, every border I passed was a challenge I overcame. Now, I plan on continuing my education and reassuring to any other undocumented students, success is possible. I want to advocate for students in situations similar to mine. No one should have to reject field trips, live in fear, or be unsure of their academic future. I want to be the one to show them, not tell them, that being undocumented isn’t a disadvantage. Instead, it is a motivator. Being undocumented helps you discover the virtue of hard work and perseverance.